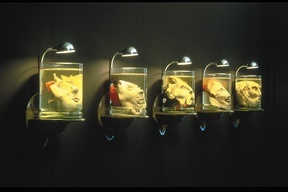 The installation Caps Arrancats (decapitated heads) consists of five faces reconstructed from the eye sockets, mouths, noses and other parts of pigs' heads. These "caps" (heads) are portraits of some of my enemies. The pieces are displayed inside glass jars submerged in a solution of water and formaldehyde and illuminated from above. The installation Poemes d'amor (love poems) is a sequence of seven pigs' hearts to which some objects have been added. The jars containing a solution of water and formol are on pedestals and they are in the following order: Fascination (heart with an eye), Obsession (heart with an ear), Hope (heart with hair), Euphoria (heart with bells), Dependence (two hearts joined with handcuffs), Loss (heart with dagger through it) and Quest (heart with chicken wings). The Maquines de Plaer (pleasure machines) brings together two pieces; Amantes (Lovers) and Estrella (Star). The Amantes are two opposing mechanisms. One slowly moves two eyes with long eyelashes suggesting a woman and the other obsessively moves a raw pig's tongue representing man. Estrella consists of a mechanism with a wheel and six tongues that the spectator turns with a handle. The exhibition opened at the Sala Moncada in the FundaciÛn La Caixa in Barcelona during the months of June and July in 1993. To date the exhibition has visited galleries and museums in Spain, Switzerland, France, Portugal, Slovenia, Montenegro, Italy, Germany and Brazil. Machines: Pascual Royo & Taller El Prat Petit.